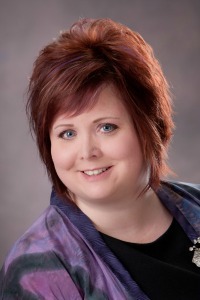 The 2013 Debut Author Bash is hosted by Nichole @ YA Reads. 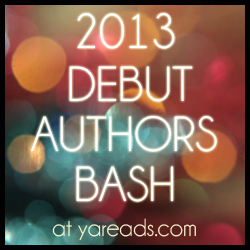 Hey everyone, and welcome to my stop on the 2013 Debut Author Bash! 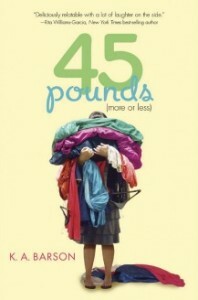 I’m so excited to be hosting Kelly A. Barson, author of 45 Pounds (More of Less), which was an absolutely amazing book! K.A. Barson graduated from Vermont College of Fine Arts with an MFA in Writing for Children and Young Adults. She and her husband live in Jackson, Michigan, surrounded by kids, grandkids, unruly dogs, and too many pairs of shoes. Question: Hi, Kelly. Thank you for joining me today! First, I’d like to congratulate you on your amazing debut, 45 Pounds (More or Less). Answer: Thank you for having me! Question: This book was realistic and inspiring. For me, this book hit close to home. I found myself nodding along to the majority of Ann’s thoughts, and grimacing when something she dealt with reminded me of a situation I was in. Tell us more about what inspired you to write it. Answer: I wanted to write a book about a real girl who struggled with weight, but most of all struggled with her perceptions of herself and those around her. Question: Ann is a very likeable, relatable character. How much of your own experience went into writing Ann? Answer: More than I care to admit! I have always struggled with my weight, too. I’ve been on so many diets I know them inside and out. It’s not just a matter of eating a certain way or doing certain things. It really does come down to self-worth and what’s going on in your head, first and foremost. Sometimes I have a hard time remembering that, so I could really relate with Ann and her internal struggles. Question: Were any of the characters (Courtney, Raynee, etc) based on people you knew in real life? Answer: Gram is kind of a mash-up of my grandma, my mom as a grandma, and me as a grandma. Ann is a mixture of me and a ton of other girls that age. Other than that, no one in particular. Question: What about Ann’s mother? What went into developing her character? Answer: The hard part with her was to balance how Ann saw her and the reality of her. The book is in Ann’s point of view, so I had to stay there, but I wanted readers to see her as a real person battling her own issues. She loves her daughter and has good intentions. They just don’t always come across the way she means. Question: The most heartbreaking part of this book, in my opinion, was the storyline involving Libby. Can you tell us more about her character, and how you came up with her storyline? Answer:I love Libby! My own experience (as a kid and with my own kids) is that they’re smarter than people think. They pay more attention to what people do than how they’re told to think. Because they parrot words and behavior, what better way to show Ann how she’s been behaving than a little sister that wants to be like her—and her mom? Question: What’s the one thing you really want readers to take away from 45 Pounds (More or Less)? Answer: For readers who struggle with weight, I hope they realize that they’re not alone and hope they can see how beautiful and valuable they are. For those who have never had a weight or body image problem, I hope they can look at those around them through a different lens, to realize that we all have issues and that everyone is worth getting to know. Question: On a lighter note, if you could go into a candy store and buy 45 pounds worth of candy, what would you get? Question: What was the writing process, in general, like for you? Answer: Long. I took almost nine years to write this book. I had to re-vision and re-start the story several times until I found its true focus. I was pretty new when I started, so every time I learned something new about character motivation and plot, I’d start over to incorporate that new lesson. Question: And the road to finding an agent and getting published? Answer: Again, that was long. But once I took two years off from submitting to learn and focus on writing, things moved along pretty quickly after that. I graduated with my MFA in Writing for Children and Young Adults in January 2011. By June of that year, I’d signed with my agent. (I’d simply queried her. She requested my manuscript and offered representation a couple weeks later.) By fall, she’s sold my novel to Sharyn November at Viking. But it was long road from 2005 to 2011. Answer: My next book is a YA contemporary about a high school cosmetology student who thinks she has her whole life planned out and under control—until everything falls apart. Question: Can we expect another book set in Ann’s world, or one similar to it? Answer: The next book is in the same city—a fictional version of my own city, Jackson, Michigan. It’s not a spin-off or a sequel, but some of the characters from 45 POUNDS might be making cameos. And now for the giveaway! Kelly has generously donated a signed hardcover, which one of you lucky people will win! In order to enter to win, please follow the Rafflecopter prompt below. The giveaway is open to residents of the U.S. and Canada and ends Thursday, October 10th. I would probably get Skittles, as they are my favorites and they are my candy of choice for going to the movies. And I kid myself that they are healthier than other types of candy. Good answer!!! I’m a chocolate and peanut butter fan myself! Reese’s!! Mmmmm!!! Oh, I’d definitely get chocolate, like peanut M&Ms! Great interview, and congratulations on your debut. It is just a *fantastic* book! Oooh, Peanut M&Ms are so good!!!! I would get rock candy, fun gourmet taffy flavor, and Jelly Bellys! Awesome question. By the way, I have been trying to get this book since before it released when there were a few Goodreads giveaways for it, but I never won. It sounds really great and everyone I know of who has read it says it really made an impact on them. I love reading about characters who actually feel real. I’m crossing my fingers that this is my time to get my hands on a copy (I would just buy one, but my income is literally zero right now thanks to a disability.) Thanks for a great interview and giveaway!!! Oooh, that all sounds so yummy!!! My fingers are crossed for you! Good luck!! I’m a more of a chocolate person so definitely chocolate covered almonds! I’m a chocolate person, too! It’s definitely my favorite! Nice choice!! I’d get Reese’s Peanut Butter Cups and Sour Patch kids…. In separate bags though! haha. Ooohhh, Reese’s are my favorite! Nice pick! 45 Pounds (More or Less) by K.A. Barson. If you could go into a candy store and buy 45 pounds worth of candy, what would you get? I would buy 45 pounds worth of Skittles. I enjoyed reading your interview with Kelly. Lindt white chocolate truffles! I just died a little inside at the thought of the magic :) fabulous giveaway! I would get 45 pounds of Smarties. They are chocolate heaven. Or maybe candy corn…. Ooohhh, both are awesome choices! Hmm, candy buttons? Chocolate rocks? Wax pop bottle things? Fruity flavored things? Chocolate flavored things? Nut flavored things? Oh my gosh this is the toughest question I will never answer. All yummy answers that I totally agree with!